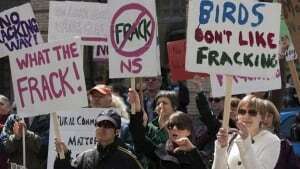 The Nova Scotia government is planning to ban the importation of water from hydraulic fracking. New Brunswick's energy minister says he's not bothered by a Nova Scotia plan to ban the importation of hydraulic fracking waste water, and is suggesting new treatment plants could be opened in New Brunswick to deal with the pollution. Nova Scotia Premier Stephen McNeil says a bill to prohibit out-of-province fracking waste is coming in the fall session of the legislature. One New Brunswick company, Corridor Resources Inc., has sent fracking waste water from the Penobsquis area near Sussex, N.B., to a facility in Debert, N.S. But McNeil said given there's a moratorium on fracking in Nova Scotia, it makes no sense to accept waste water from elsewhere. "If New Brunswick wants to do fracking or any other province wants to do fracking, don't look to the province of Nova Scotia to deal with your fracking waste," McNeil said. New Brunswick Energy Minister Craig Leonard says the ban won't be a big problem for the industry if large-scale development happens. That could include building new waste water plants in New Brunswick, which Leonard said would be subject to strict environmental rules. "Whether that means taking it to other locations, such as Quebec, or establishing their own facilities here, that'll be all part of that process," he said. Leonard says Corridor Resources has been using propane instead of water lately, so it's not as much of an issue at the moment.